It isn't all drums and roses but this kit will give any beginner a firm foothold into the world of drumming and it's great for practice too. Intuitive menu and easy to operate. Decent value. Not the best build quality or playability. This brand-new, conveniently compact electronic drum kit is the latest in a line of own-brand, wallet-friendly e-kits from Gear4Music. At a snippet under £200, this set is also the most affordable of the wide range available from the web-based company. However, if you fancy shelling out an additional £20 more, this will treat you to one of G4M's tremendous package deals which includes the DD400 kit, a set of headphones and a drum stool - representing even better value for money. The five-piece set-up includes drum and cymbal pads, cabling, cymbal arms, drum rack, drum module and two controller pedals to create a fully-fledged electronic kit. The pad configuration is fairly typical of almost any modern electronic set-up, with the rubberised pads designated for snare, three toms and three cymbals. As per usual one of the cymbal pads is to be used for hi-hat (in conjunction with the controller pedal), while the other two cymbal pads are set for a crash cymbal and a ride. 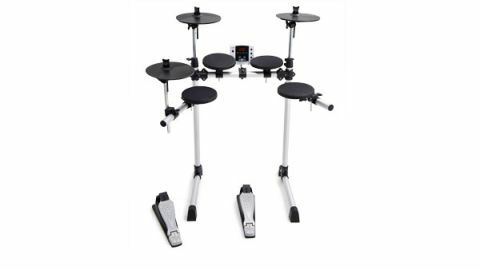 "Using the DD400 is really quite simple thanks to an incredibly intuitive menu system which is logically laid out"
This electronic kit is suitable for a beginner or just about anyone wishing to get into electronic drums on a tight budget. At under £200 you would imagine there's going to be a pretty low spec and not much in the way of features, however the drum module does include worthy aspects such as 64-note polyphony, reverb (on/off), 10 preset kits, 40 songs using the onboard GM Midi sounds (so you can play them at various tempos) and auto power off. Atop the silver-coloured drum module is a series of mode LEDs (pattern, voice, click, kit) and a respectably-sized three-digit alphanumeric LED display which shows a variety of information (depending on mode), such as kit number, voice etc. Each control button is conveniently sized and positioned depending on the likely access and function. There are only seven (including the volume control), and the largest of these, the 'value' ('+' and '-'), is used to adjust any of the performance parameters such as kit or preset drum patterns etc. The menus are intuitively structured and, as the functions themselves are fairly basic, there's no need to traipse through pages of parameters, making the module that much easier to operate. Attached to the underside of the module is a DB-25 comms port connector (favoured by many manufacturers for the input of the various pads), which negates the need for masses of trigger input sockets along the unit, ultimately saving space and set-up time. Sited on the back panel is the power supply socket, power switch, USB socket, five-pin din Midi Out, Right and Left (Mono) outputs, Aux-in and Phones. As with many electronic kits the Aux-in will allow connection of an iPod or CD player for the user to play along with their favourite tracks mixed in with the sound of the kit. The hi-hat controller pedal works in conjunction with the hi-hat cymbal pad, giving the ability to produce familiar hi-hat tricks such as splashes and subtle 'chick' sounds. However, both the hi-hat pedal and the kick operate in a similar way, by a simple switch inside of each pedal. This means it won't be possible to vary the volume and create dynamics with the kick. However, dynamics are possible with the rest of the kit as the module interprets the varying velocities from the piezo transducers of each drum and cymbal pad. The kit comes delivered to my door from G4M in one large but manageable (even for a courier!) cardboard box weighing-in at only 16kg. Unpacking it reveals a standard 'H' shaped rack set-up having the various brackets and clamps already set in their approximate position. Each of the lightweight aluminium tubes are held together with brackets adjustable by standard tuning bolts, whereas the pads have winged bolts, so adjustment can be made even in mid-performance. Other than securing each length of tubing, there's not much in the way of assembly work to be done before the whole rack is set up and the pads are in place. Once powered on, the kit is ready to play in seconds, with quite a sizeable click through the headphones, and as we quickly discover (as with any electronic audio equipment), it's prudent to keep the volume down when switching on! Using the DD400 is really quite simple thanks to an incredibly intuitive menu system which is logically laid out. Running through each of the preset patterns is good fun and there's quite a range of song types and styles. Again, as on some of the cheaper modules, we are subject to a few cringe-worthy tracks and the occasional amusing ones too but, to be fair, the selection is still impressive. While the sound isn't exactly full-on hi-fi and the reverb has an awful 'slap' sound which drives us to distraction, there are some convincing snares and kicks. The speed of the module certainly interprets each strike reliably and can even manage to keep up with some blistering wallops around the entire kit. The rack is sturdy enough for even the most 'enthusiastic' player and it's great to be able to quickly fold the legs in and place the unit up out of the way to free up the space quickly.